This (the machine invented by the famous Chinese author, Lin Yutang, and described on the first page [first four paragraphs] of the Wikipedia article here) is probably the closest the Chinese ever got to decomposing their script into an "alphabet" consisting of "letters" (recurrent graphemic elements that can be combined in a principled way to form all of the characters / morphemes in their writing system). You'll note that it didn't really work during their presentation to the Remington Typewriter Company executives. The press conference demonstration they had the next day was probably of the carefully rehearsed, staged, orchestrated sort designers of Chinese information processing / technology software and hardware often present (the kind documented by Li-ching Chang in her film made at a vocational high school in Beijing), not one prepared to respond spontaneously to tasks posed by the audience. Judging from my own experience with Chinese software and information processing / technology developers over more than a quarter of a century, this may have been what went wrong when Lin presented his typewriter to the Remington executives: they asked him (or his operator) to type something impromptu. Incidentally, the development of this fatally flawed typing machine left Lin — whose books were bestsellers in America — bankrupt. The "typewriter" described on the second page (fifth paragraph: "Another kind of Chinese typewriter") section of the Wikipedia article cited above is the only kind of machine for writing Chinese that achieved fairly widespread use. (Most of the typewriters shown here are of this sort.) It was basically a limited font of about two to three thousand of the most common characters, with hundreds or thousands of more obscure characters kept in boxes nearby, to be laboriously sought out when needed (most typists just wrote such characters in by hand [if they knew them; but usually they were simply copying from a printed page or somebody's handwritten draft anyway — even now, except with pinyin-inputting systems, Chinese have not benefited very much from touch-typing] rather than try to find them in the boxes). The Wikipedia article claims that "good operators were able to type around 70 words per minute." First of all, this probably means "characters," not "words" (which are largely disyllabic). Secondly, this could only have been true of a highly skilled operator presenting a carefully prepared and practiced text without any unusual characters (i.e., beyond those in the main tray). The typists I observed using these machines in Taiwan, China, and at the UN back in the 70s and early 80s — all professionals, not casual typists — seldom exceeded about 10-12 characters per minute under the best circumstances (only common characters found in the main tray, and working from clean drafts or copying from printed materials). Many of the difficulties outlined above have continued even into the computer age, which accounts for the (should I avoid using "literally"?) thousands of different inputting systems that have been devised during the past three decades. The vast majority of individuals, both for short text messaging and for word processing with computers, now use various types of romanized inputting, with those methods that take advantage of word segmentation being the most efficient. Thanks to Michael Carr for the first Wikipedia reference. 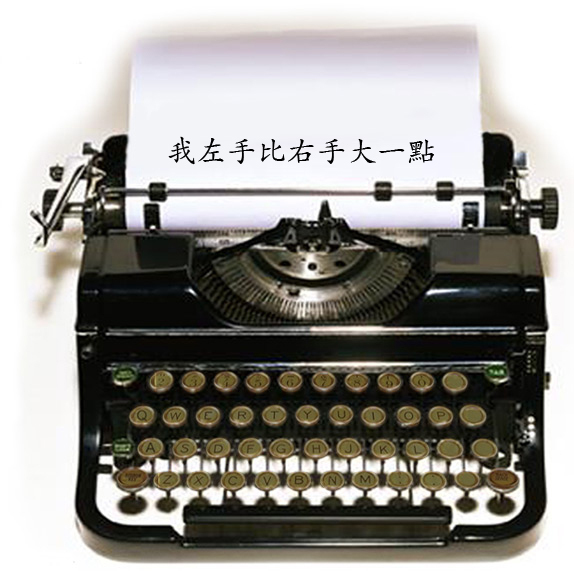 Tom Mullaney wrote up an informative short history of the technological development of the Chinese typewriter (and its use as a punchline in the west) at The China Beat. My father once told me about learning to use both japanese and chinese typewriters in the 40's. He said they were modular, with swappable keysets. From his description i got the impression that there was a system for determining which module a given character belonged to and therefore which one to swap to next. He claimed that he got to be at least minimally competent at the japanese one. But as for the chinese, it was just hunt and peck. Still, according to him, people use to come and watch him at the chinese keyboard because they were amazed to see anyone able to handle it at all. Of course there probably weren't too many native chinese involved. I assume that this picture is a joke, but I'd like someone to explain the joke to me. The context is about word processing in Chinese. Tom Mullaney's lambasting of Western ridicule of the Chinese typewriter seems to curiously miss the point. Surely the Chinese typewriter is not taken seriously in the West because it is a prime example of solving a problem at the wrong level? The real problem is a terribly complicated and inefficient writing system. The solution is to replace this system with pinyin (or some form of alphabetization), not to exercise ever greater technological ingenuity. It's a shame the Wikipedia article merely mentions this decomposition system, but does not describe it. Frank: The patent (all forty pages of it) can be viewed at the USPTO's website — search for patent number 2613795. Thanks for the reference to the USPTO's website, Bob. Perhaps I don't know how to navigate it, but even when I searched for patent number 2613795 and found it, there were neither texts nor images that I could manage to see. A picture of a Japanese typewriter at Japanese typewriter gives a pretty good idea of what has just been described. Victor: After you find the patent, click on the "Images" button. If no images come up, your browser needs a TIFF plugin. Try AlternaTIFF if you're using a Windows machine. The Chinese text says: My left hand is a little bigger than my right hand. Not clear what the joke is, though. First result is the patent in question and you have the option to download a .pdf or read in your browser. Google Patents is a little easier to use for viewing, but not as helpful as the USPTO's site when searching by field. Nick says, "The real problem is a terribly complicated and inefficient writing system." which I agree with on a technical level, but my impression, hunch, whatever you want to call it, is that in the minds of the Chinese, their writing is inextricably a part of their culture. Therefore, on an emotional level, it's not an easy problem to address. i saw how an old-time chinese typewriter worked. the box was big enough to contain about 2,000 to 3,000 characters, grouped according to their radicals. the center of the box was usually preserved for the characters most commonly used in the office where the typist worked. that is, if the typist worked in a financial organization, the center of the box had characters most commonly used by the organization. it can be well imagined that a typist might find great difficulty if she was transferred to work as a typist in another organization. she would have difficulty locating new words. each box was customized by a specific typist. there were almost no universal character boxes. another thing that i noticed was that the typist must read the characters in the box in a wrong way: from head to foot and from the head direction. one would need a lot of training to familiarize oneself with such an arrangement. then one would need accurate eye-hand coordination. the character-picking mechanism must be moved accurately to the space just above the tiny square cell where a specific character stays before it can be accurately clasped and picked up and hit the stencil paper above to leave deep enough impression. a typist would have to take a break after a short period of time. it is a great torture to eyes. an experienced typist could certainly type more than 10 to 12 characters per minute. no typist could use another typist's typewriter without spend a cerntan amount of time getting to know the locations of characters in the box. those who championed replacing the chinese characters with a pinyin system have lost their biggest argument since fast and efficient inputting systems have mushroomed over the last 25 years. nowadays it is easy and fast to input chinese. A lot of people in Taiwan and some in mainland China use the bihua (pen stroke) input system on cell phones. Users claim that system is faster, once you get used to it. Each key on the phone keypad is one of the basic pen stroke shapes (vertical slash, horizantal, diagonal loopy shape, dot, etc.). and by typing them in the order that they are written, you pull up a list of characters that continues narrowing as you type, until you reach a unique one (usually, before you have actually finished typing in all the strokes). There is also a non-pinyin based standard keyboard in which the keys are marked with the set of pen strokes, and a selection of the most common radicals (elements)…i also remember seeing the bo-po-mo-fo phonic symbols on a keyboard. It would make sense that people in Taiwan use non-roman based typing systems, because (a) they never really ever learned a romanization system, because in kindergarden and elementary school they learned characters with bo-po-mo-fo, not with roman characters (b) the KMT refused to adopt pinyin, and the Wade Giles romanization system is not as good as pinyin (in my totally biased opinion). Incidentally, typing has considerably increased adult proficiency with pinyin. In the past, in Chinese-language contexts pinyin was above all a literacy-learning tool not used much after elementary literacy education, analogous to the phonic symbols in English which I never mastered in second grade and still can't use or read (as a result of which I'm completely unable to form or recognize the sounds of my native language). People used roman letters in organization/numbering contexts (as the series ABCD), but not pinyin. I've met several 40-something mainland Chinese people who use bihua because their pinyin is not good, and others who use pinyin but sometimes have to ask for a reminder of how to spell something. I know you're joking, but just in case anybody who doesn't understand Chinese reads this and thinks you're serious and starts thinking you might be right: Replacing Chinese characters with roman letters is not just a laughable example of the eurocentrism of modernization movements, it is a very bad idea. 1) Too many distinctions used for effective, subtle or poetic writing (not to mention orthographic play/ puns) would be completely lost. Anything complicated or academic would get more vague, and classical poetry and writings would be like gibberish, making it nearly impossible for most people to read anything written before the twentieth century vernacular movement, which would be a loss. 2) The diversity of names for people, places and things would be drastically reduced, making for all sorts of mixups and hyjinks. Elementary school would get easier, but the rest of life would get more difficult. 3) There already were Chinese phonetic symbol systems and other ways of decomposing characters in order to organize dictionaries etc. a long time ago. If you were gonna throw out one of the most remarkable symbolic systems humanity ever produced, why would you think it had to be replaced with roman letters? 4) The main argument for simplifying characters, and for getting rid of them, was that it would make literacy easier to achieve. These days kids don't seem to have much trouble getting literate, regardless of whether they are learning traditional characters (in TW/HK) or simplified characters (PRC). The nationwide mandatory education system was what made the difference. I mean, for somebody who started learning characters late, the simplifed system is a blessing, but now that computers have made traditional characters as easy to write as simplified ones, there isn't much argument for simplification–and many people in the mainland are also functionally literate in traditional characters. @joe: those who championed replacing the chinese characters with a pinyin system have lost their biggest argument since fast and efficient inputting systems have mushroomed over the last 25 years. nowadays it is easy and fast to input chinese. Computer input systems may have alleviated the problem somewhat, but I don't believe the claim that new input methods make typing Chinese characters as easy and fast as typing the Latin alphabet. No way. I frequently see native-speaking Chinese people typing in pinyin or in English anyway, to avoid having to work with Chinese characters. The biggest argument for abandoning characters has not changed at all — there are too many glyphs in Chinese, probably two orders of magnitude more than are really needed. Fast input methods may be available for accomplished experts in this clunky writing system, but it's still a clunky writing system, and becoming an expert is a huge effort. Korea and Vietnam abandoned this writing system for sound reasons. Someday the Chinese might also abandon it. Also, the mention of pinyin here implies a false dilemma. Pinyin is of course not the only system ever proposed for replacing Chinese characters. Pinyin is clearly not adequate for writing Mandarin, but this in no way implies that alphabetic systems cannot ever be devised for Mandarin and other Chinese languages. "Pinyin is clearly not adequate for writing Mandarin, but this in no way implies that alphabetic systems cannot ever be devised for Mandarin and other Chinese languages." Indeed, this is exactly what Gwoyeu Romatzyh is. I wonder what the typing speed in GR compared to a stroke-based input method would is. any chance of using the typewriter's category system with today's hanzi software? Now that as you bring up a category you can confirm the character class on a computer screen, would it be slightly easier to master the system? I imagine it would be slightly slower than pinyin-based computer software, but pinyin I imagine is a problem if your particular dialect happens to violate pinyin conventions. are there any eye witness narratives of the presentation given by mr. 林語堂 to the remington typewriter co., or is it just conjecture? my point is that although said typewriter seems to be a little miracle if it indeed worked, for sure the refusal on the side of that company does not imply technological and/or marketing failure; the same with mr. lin’s subsequent economic failure. rather, investors are driven by a lot of reasons, of which true clairvoyance is for sure not one. i’d like to name gutenberg as one example, who invented the modern printing for the western world but would have died in utter poverty (except for a subsidy granted by a sympathetic duke that he enjoyed in his last three years); this invention captured europe like a wildfire within the course of a decade but still investors had abdictated one by one, not being able to fully grasp the chances. today, it is hard to prove the workability or otherwise of the mingkwai typewriter, as there seem to be only one or two prototypes and a patent document left. Thanks to everyone for this wonderful thread! One of my students forwarded it to me, much to my delight. I am currently writing a global history of the Chinese typewriter, and have recently returned from an archive trip that, I'm excited to report, will help open up the story of the MingKwai machine and Lin Yutang. As it turns out, the story of the "Remington Debacle" is in need of serious revision. First, Remington was not the company with which Lin Yutang had his closest connections. Second, corporate interest and investment in the MingKwai proceeded well after the failed presentation, which prompts us to reconsider why it didn't "take off." P.S. For those of you who know the whereabouts of Chinese typewriters, I would be grateful if you could make contact. I am working on a museum exhibit which will feature a number of different models of Chinese typewriter, and there is still space for a few more machines. A CHINESE typewriter of unique design, utilizing no less than 4,000 written characters, has just been invented by Mr. Hou Kun Chow, a graduate of the Massachusetts Institute of Technology, one of the first Chinese students to be educated in this country, and now a mechanical engineer in Shanghai. A Chinese Typewriter. — An American missionary in China, Rev. D. Z. Sheffield, president of the Tung-Cho College, has invented a remarkable typewriter, capable of printing the 4,000 characters the Chinaman finds absolutely necessary for transacting his ordinary business affairs. — Philadelphia Record. I wonder how closely the device described in the 1916 NYT article resembled the one invented 17 years earlier by Sheffield. Did Hou Kun Chow merely reinvent or copy the same kind of Chinese typewriter? Oh, i forgot something else i learned from my father. Some band of heroes got together and numbered the most commonly used (in someone's judgement anyway) chinese characters for use in telegrams. And the same was done for japanese. I still have his books listing those characters somewhere. "Computer input systems may have alleviated the problem somewhat, but I don't believe the claim that new input methods make typing Chinese characters as easy and fast as typing the Latin alphabet. No way. I frequently see native-speaking Chinese people typing in pinyin or in English anyway, to avoid having to work with Chinese characters." I frequently see native-speaking English people typing in English at an alarmingly slow rate, almost as if they grew up in a time where young children weren't expected to type at least at something like 40 words per minute. They're called old people, people who didn't have a certain kind of education, or people who lacked some technologies. Among actual young people from mainland china who use computers (this certainly doesn't merely describe the 'highly-educated' as anyone who has been to China knows, pinyin based systems absolutely dominate and the speed is much faster than typing English. You clearly are not up to speed on the technologies in use among the youth or see them in action. Unlike standard english letter input, the dominant pinyin input systems (e.g. sogou, the one google blatantly stole) can auto-complete any input from the keyboard, learn from your input habits, and allow work off of shortcuts. Extremely long names of organizations are not only often known or guessed at by the software's own recognition of common collocations, but by typing the pinyin for the beginning character or two, or just the first letter of the pinyin for the first couple characters, will appear. Typing "The United Nations" in English is a lot of keystrokes, Lianheguo is already a lot less, but most people will stop at "Lianheg" or more intelligently "lhg". Find someone who uses these systems, someone young who actually knows what they're doing. Don't get me started on the the texting input systems or systems outside the mainland which similarly can be incredibly quick if used by people who know what they're doing. HK people struggle with input system speeds because they're often not phonetically based and they never spent the time to learn the system well. HK people using phonetic systems obviously have to master those phonetic systems first (rare). Given that, I've seen "non-professional typists" who simply took a little while to learn Wubi and they type very fast, maybe not as fast as systems that guess, learn, and allow simplifications (though I'm sure there are some Wubi software suites that have those features) but very fast. one big problem that encounters those who want to replace chinese characters with pinyin system is the dictionary itself. the chinese language has too many homophones. it is extremely rare that a character stands alone without a homophone. in order to put together a pinyin dictionary without any chinese characters in it, one has to abandon the idea of listing all the 55 homophones of fu together, for example. it would be impossible to tell apart the 55 homophones and list all different meanings and explain the meanings of phrases which any of the 55 is involved. imagine an annotation system that applies to all the homophones in chinese. you can imagine each character looking like a hedgehog with all kinds of tiny symbols indicate what this particular character means, how it is pronounced, which of the 55 homophones it is and how to check it out in a pinyin dictionary. when these phrases involve other homophones of other words, difficulty gets multiplied. years ago i was in a debate with some guys advocating pinyin systems. none of us were professional linguists or scholars specialized in language reform or anything like this. the debate was serious but amateurish. i just put this request to these guys and asked them to turn one page of xinhua cidian into their pinyin dictionary page. they were silenced. it wouldn't be possible to understand such a dictionary. and just imagine a 7-year-old chinese or an adult foreigner starting his first chinese lesson and is given a such a dictionary as a guide. it would be easy to learn 300 or 400 essential chinese pronuncations. he would be totally lost. we guys in the debate all had knowledge of chinese characters. just magine someone encountering the pinyin chinese without any knowlege of chinese characters lurking in the background as a cultural environment. i certainly don't mean to say that since these guys couldn't come up with a page of pinyin dictionary, no one could ever. that reasoning would be absurd. but it still seems reasonably impossible to design such a system to replace the existing system. i input chinese by using pinyin inputting system. that does not mean chinese characters are uesless. it seems to me that the beauty and advantages and pragmatism and efficiency in the characters are highlighted by this inputting system. the big argument that chinese characters made modernization impossible is dead. the argument was something before the computer age. and when homophones are used, chinese pinyin words would probably lose the ability to act as roots to form new phrases. most chinese characters can serve as roots and form new phrases. checking pinyin words out in a pinyin dictionary would be a nightmare. reading a story aloud would be a nightmare to parents, too. they need a nice lamp and large pinyin word books to recognize these pinyin words and the group of tiny symbols around each word before they know what each pinyin word means and and how to read it. they must recognize them fast enough to read a story at a normal speed. thank our ancestors for the written chinese language that allow stories to be read fast enough to entertain kids. were there false starts in the beginning? was there something in the early development of the written chinese language that governed its growth and helped its efficiency and eliminated wrong directions? I'm confused. If Chinese is so homophonous it can't be written phonetically, how on earth can it actually be spoken? [(myl) This excellent point is commonly made, in response to the argument that Chinese homophony precludes any phonologically-based (alphabetic or syllabic) writing system. The standard rejoinder is that spoken Chinese is different from written Chinese, in the direction of being more redundant. This is no doubt true to some extent — the spoken versions of all languages (e.g. English) are more redundant than the written styles, as measured by per-word or per-character entropy estimates. I haven't seen any evidence that this difference is larger for the comparison of modern written and spoken Chinese. wubi inputting system is probably the very first popular chinese character inputting system. wubi means you find a word within five keystrokes. the system is based on radicals. people learn the inputting at first by memorizing their positions on the standard computer keyboard. a special combination of these keystrokes can produce a word. the system is time-consuming to master. for those who did not have a good education in pinyin, this is a very good choice. wubi has seen several major improvements since it got started. phrases and suggestions are added so that when the first character appears, you have many similar phrases to choose from. like what you have when you input english at google's search bar. an inexperienced wubi typist often has a wubi dictionary at hand. it guides people to find strokes for characters. with practice, wubi is very efficient. it is popular with typists at printer shops and government typists. i am under the impression that wubi is widely used by girls from countryside where pinyin was poorly taught and where people had strong accent in speaking putonghua. and now there are professional typists who get special training at typing and are hired by government agencies, law courts, news agencies, national people's congress and cppcc, etc. to record what is said on important occasions. these pros can input chinese really fast. they use a special portable computerized typewriter and they are better and more efficient than stenographers. there are reports about these typists, who are said to be earning good money. @joe: one big problem that encounters those who want to replace chinese characters with pinyin system is the dictionary itself. Again, we keep getting back to this false dilemma. Pinyin and similar systems are not the only alternatives. It's obvious that a purely phonetic alphabet cannot be used for writing Chinese languages. But it's likewise obvious that alphabets do not need to be purely phonetic. The presence of semantic features in the writing is not the problem. The problem is simply that there are too many glyphs, far more than are needed. if used by people who know what they're doing. That caveat ruins the whole argument. The hardest part of typing Chinese characters is knowing the characters in the first place. Years of training are needed before you can even begin. In contrast, you can learn the Russian alphabet in one day, or a few days. I’ve now had a chance to examine Lin Yutang’s patent application for his MingKwai (“Clear” and “Fast,” which it was not). The typewriter he laboriously designed was extremely complicated and intricate, with hundreds (if not thousands) of pieces, most of them very small. Each of the pieces would have had to be machined to extremely fine tolerances. In going through each page of the application I immediately noticed some strange things. For example, the keyboard numerals only go from 1 to 8, without any 9 or 0. More suspicious in terms of how the MingKwai would have composed various Chinese characters, some of the keys show radicals, some recurrent components, some parts of radicals, some parts of recurrent components, and some just different types of strokes. However, not all of the 214 Kangxi radicals are present, nor – by any means – are all of the recurrent components of characters, though the basic stroke types all do seem to be present. One thing that must be kept in mind when attempting to assess the workability of the MingKwai typewriter is that the elements of characters change shape and size depending upon where in any given graph they may occur. Proportion is all important if one is to produce an esthetically acceptable graph. It must have cost an enormous amount of money to produce the prototype MingKwai, and putting it into production would most likely have been prohibitively expensive for widespread use. Lin Yutang was not the first would-be genius to have been defeated by the Chinese script, nor will he be the last. 1. It takes an enormous amount of time to learn. 2. It is normally used by professionals (full-time typists). I only know a couple of non-professionals who can use WUBI, but they do so with a very low level of proficiency. 3. No. 1 and No. 2 account for the fact that, even though the Chinese government actively promotes WUBI, the vast majority (probably over 95%) of individuals have adopted PINYIN (Romanization) as their preferred method of inputting. 4. Even for professionals, whom I have often closely and carefully observed for long periods of time silently standing behind or sitting next to them, it is often difficult to call up a desired character (one they are not thoroughly familiar with and have to type constantly). I have frequently seen them struggle to produce the character for which they are seeking and then, in frustration, they will switch to PINYIN to find it (though they will seldom admit this, even when you catch them in flagrante delicto). Regarding the 0-8 on Lin Yutang's machine. The MingKwai was based on an input system of Lin's own design incorporating both radicals and phonetics, which the operator used in order to instruct the machine which character s/he was looking for. The machine would then present the operator with all of the characters that fulfilled the particular radical/phonetic criteria inputted by the operator. The operator would then use the numeric keys to select one of the eight resulting characters. The reason there is no "9" is because of Lin's design: he designed it in such a way that no more than eight characters could possibly result from any given set of keystroke instructions. Hence "9" was unnecessary. I have reviewed all of the archival files pertaining to the manufacturing cost of the MingKwai, and contrary to what I also thought at one point, the companies involved did consider it commercially viable. They undertook an exhaustive examination of manufacturing expenses, soliciting proposals by engineering firms through the U.S.
Sheffield's and Zhou's machines were remarkably different than Lin's. Their prototypes also differed markedly from one another. Then, once you take into account all of the other inventors (so far, my tally is at approximately four dozen and counting! ), it starts to get really complicated and interesting. @ franz bepop: "Again, we keep getting back to this false dilemma." i didn't get back to this false dilemma when i discussed with guys who championed replacing the current system with a pinyin system. the dictionary issue was s a nasty little thing that they failed to kill. they talked nothing about a system which uses something else and pinyin. it is still a nasty little thing to kill a pure pinyin system. the number of chinese characters was much greater in its history. kangxi zidian is a proof of the huge number. fortunately the total number is reduced. this is a historical trend and the trend reflects how something inside the language operates and governs the development of the language itself. a big part of the characters as recorded in kangxi zidian is useless, in a sense. they now exist only for dictionaries of ancient words and phrases. chinese is as difficult as any other major language in the world. i may be wrong, but i believe one needs to spend roughly the same amount of time to master a language, no matter it is chinese or english. how do we make sure that there are too many glyphs? i am not convinced. let's examine the study and the conclusion before we can be sure. i've heard chinese students complain about too many english words to commit to memory. could their observation about the huge number of english words be used as a reason to simplify english? as for the ease of learning to input russian, well, such an ease is only valuable academically and can meaningfully help those who have the mastery of the language. it takes a long time to master the russian language. if one does not know anything about what one is inputting, the information inputted is practically useless. one needs to know russian to input russian in a meaningful way. yes, it takes much time to master wubi. i understand most chinese hate wubi and that's why most people prefer pinyin. however, that popularity of pinyin inputting is not to be construed as a yearning for a written pinyin language. the popularity of a pinyin inputting system does not guarantee a similar popularity when a written pinyin language is invented and introduced. the reason would be simple: a written pinyin system as recommended and dreamed up in a half-baked and willful way by some may greatly complicate the learning and using of a language. somewhat like wubi as an inputting system. if a pinyin system would work, why not a system of letters? wubi is a system of meaningless combinations of letters. and why not use the morse code to replace chinese or any other major language? some theoretical possibilities are useless. chinese is not perfect. but as a language, it is perfect enough that it has every reason to be left alone as it is. the people using it will bring new things to it and take care of it and move with it into the future. why bother to reinvent a new wheel? terribly sorry for got the name wrong. i apologize. i may be wrong, but i believe one needs to spend roughly the same amount of time to master a language, no matter it is chinese or english. I can only speak anecdotally on this, but this seems very untrue for second-language learners — I know people who can speak Mandarin or Cantonese with near-native proficiency but are still unable to read all but the very simplest texts, something I've never encountered with ESL speakers of comparable fluency. (This isn't to say it never happens, but it seems to be a less common phenomenon.) For native speakers I can only rely on the accounts of others; John DeFrancis estimated (on the basis of conversations with Chinese and European teachers) that it takes Chinese students about six years to attain a level of literacy their French counterparts can manage in half the time, but this is an old source (1980s) and comparing literacy across languages is not an easy thing. In any case, the idea that written Chinese (with its several thousands of inconsistently- or non-phonetic glyphs) can be "mastered" as quickly as, say, written Turkish (with its 29 highly phonemic glyphs) defies common sense, if nothing else, and I'd like to know more about your basis for this claim. how do we make sure that there are too many glyphs? i am not convinced. let's examine the study and the conclusion before we can be sure. The problem is that practical studies are rather thin on the ground. A good way to remedy this would be to recognize pinyin as a Chinese orthography alongside characters, rather than a mere annotation for the the character-based script. Such a policy, even on a limited or experimental basis, would allow the issues raised here — the purported necessity of characters, the degree to which homophony impairs the writing and comprehension of phonetic Mandarin — to play out in the real world. Until then, the questions remain largely theoretical and the answers dependent on imperfect extrapolations from previous examples (Dungan, Xiao'erjing, Sin Wenz), although the very existence of those examples suggests nothing should be ruled out as impossible. @joe: how do we make sure that there are too many glyphs? Let's say 500 is too many. It's an arbitrary number, but we can use it as a thumb rule. If you think you need substantially more than 500, you are mistaken. It's simple combinatorics: with 500 glyphs, the number of possible 5-glpyh permutations with no repeats is 30,629,362,512,000. No one can claim that this is not enough. In the west, we use Roman letters, but we abandoned Roman numerals long ago, since Arabic numerals are so much simpler. Can you imagine if someone tried to use Chinese characters as numbers, instead of Arabic numerals? Can you imagine doing arithmetic where the first 10,000 integers each had its own symbol? That would be silly. It would make arithmetic a humungous challenge. Using more than 10,000 characters to represent speech is a similar kind of silliness. Pinyin can't handle homophones, and doesn't handle tones very well. Therefore, the current system of 30,000 glyphs is the only possible way to transcribe Chinese. This line of reasoning is utterly preposterous. Yet it is the first and loudest argument used by supporters of Chinese characters and opponents of any innovation. You misunderstand the word "language." English is a language. "A, B, C, D,…" is a writing system, which can transcribe English, Vietnamese, Turkish, Swahili or other languages. Language is speech. Writing is not language, writing is a representation of speech, a representation of language. Mandarin is a language. Cantonese and Wu are languages. You can call Chinese characters whatever you want — call them letters, call them characters, call them sinographs, ideograms, pictograms, whatever you want. Just don't call them language, because they are not language. The number of words is a property of a language. The number of letters or the number of glyphs is a property of a writing system. English may have 500,000 words or maybe 1,000,000 words. I have no idea how to count them. Yet they can be transcribed using less than 100 glyphs: 26 letters plus a few other symbols. That's it. Mandarin could also be transcribed using a small number of glyphs. There is absolutely no need whatsoever to work with multiple thousands of glyphs. There is no need for it at all. All other things being equal, who faces an easier task in learning to read and write their language: a fluent Russian speaker or a fluent Mandarin speaker? If your answer is "neither" or "it's not meaningful either way," then, well, I really don't know what to say. language is not speech only. language can't be defined that way. check it out in wiki and dictionaries for the definition. i also want to add: probably not extremely scientifically, a language can also be something one uses to think silently. it doesn't have to be audible speech. what the language does in the brain is more than speech. probably not scientifically again, i would rather imagine that the language is embedded in the brain and works like a software without speech. i can be totally wrong about this. but my point is that language is more than speech. i don't know about other languages, but chinese is a system that includes both speech and writing. in its primitive form, chinese existed as speech only. then it developed writing. writing is not just something that tags along or take a ride. characters is part of the chinese language. for some tribes, language was or is speech only. but language is more than speech for many other tribes and nations since very ancient times. my educated guess is that language is more than speech. happily i find many lexicographers are with me on this point. when it is said that chinese literary giants in the past have contributed to the beauty of the chinese language, what is meant is not that they have contributed to the speech part of the language. chinese as a language grows in both speech and writing. it has long since passed the historical threshold before which it was only speech. the language as it is can not be narrowed down to speech only. i didn't and don't use that so called pinyin fallacy. i asked guys to come up with a pinyin system that can be actually used in everyday life and by everyone with a decent amount of education. they were silenced. i don't mean they were not brilliant enough to invent a pinyin system. they were silenced mainly because they became brilliantly aware how pragmatic a writting system should be and how inefficient the system they suggested would be. my request means to me all the time that i am willing to see such a system and i am willing to use such a system if it could be created and found pragmatic and usable enough. the request is more than an argument designed to silence arguments. if there is such a syllogism or pinyin fallacy, it is not mine. nor have i ever used it. what i have said is that pinyin can't handle homophones practically and pragmatically. i have never said it can't handle them at all. i have never said pinyn doesn't handle tones very well. i am never aware that i am thinking and reasoning by using the second part of the syllogism. from what i have said here i can't see how it can be safely concluded that i have suggested that it is the only possible way to write chinese. i never argued that the current chinese characters are the only way to transcribe chinese. didn't i suggest morse code? didn't i say pinyin? didn't i suggest wubi? even the hedgehog like pinyin system that i mentioned could be a written system to write chinese. but these things are only academically valuable. they are not pragmatic. that's partly why i believe even though chinese is not perfect, it is a good enough language to be left alone. when it comes to science, literature, etc, the language is also capable enough to handle these things. it is not impossible to master such a language. it may be very difficult to learn chinese as a foreign language. generally speaking, mastering the chinese language is not as difficult as mastering any other major language. 30,000 glyphs are not impossible or nightmare. when they come together and form a language called chinese, it is just as good as other languages. where else could i find another language of 30,000 glyphs equally beautiful, poetic and efficient? Some of your arguments against Chinese writing reform are completely irrelevant. 1. How much would writing reform cost? Well, the PRC can certainly estimate this, given that they have done it several times, though not to the extent of eliminating Hanzi entirely. 2. International conventions and such are irrelevant. Obviously, for years, interested parties will need to be able to read Hanzi. Just as now, you need to read Fantizi as well as Jiantizi. 3. Ancient literature already cannot be read by modern readers unless they are trained in it. The characters have changed over time and have changed meaning. The sentence patterns have changed. Anyone who claims that modern Chinese can read ancient texts automatically because the writing system looks the same is wrong. It's an absurd claim; it's like saying that modern English speakers should be able to automatically read Latin because it uses the same alphabet. None of the educated Chinese people that I know can read classical Chinese. 4. China might have 1.3 billion Chinese speakers. But it's false to claim that they are all equally literate. Thus many of them won't even need to be re-educated, because they would be educated fresh with an easier system. 5. Documents will be transcribed to the new system as needed. It would take decades but it would happen. Other countries have done it. China is no different than Korea in this regard. Finally, you claim that Hanyu Pinyin is not usable as an alphabetization because it's too ambiguous. Personally, I disagree; I think you'll find that for most text there won't be much room for ambiguity with Hanyu Pinyin (or any pronunciation-based alphabetization). The problem is that most Chinese speakers are not used to seeing Hanyu Pinyin and thus they have a hard time reading it. Since they are not used to it it is harder for them to accept it. However, even if I am wrong about Hanyu Pinyin, that does not mean that one could not make a better system. Want to cement the meaning into the syllables? Just add the 214 radicals to the "alphabet" and put the radical next to the syllable. Which qing was that? Oh, the heart 忄qing. That won't completely eliminate problems but it would help. I invented this system just off the top of my head right now; you can call it Shiny and New pinyin, or Liangxin Pinyin. Maybe someone else already thought of it? Anyway, the point is that with a little imagination it would be possible to replace Chinese writing with something that is profoundly easier to use than Hanzi. Even if you don't like Hanyu Pinyin.